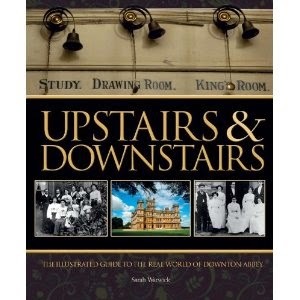 Upstairs and Downstairs: the illustrated guide to the real world of Downton Abbey by Sarah Warwick takes you through the exhausting day of a servant in a large Edwardian Home. Depending on the servant's status his or her day could begin as early as 5 am and they could easily work straight through until bedtime with only a brief break for meals. The work was hard and tedious and expectations of behavior was exacting. Warwick pairs up the progress of the typical servant's day with the change in society in general ending with the the dissolution of many of the large estates and the new life former domestic servants found for themselves in factories and other types of employment. As all Corrie fans know the Rovers Return is the place to be. This is where you will find the action - the romance, the fights, the entertainment and even births and deaths. In Tim Randall's The Rovers Return: Coronation Street official album you will find a pictorial history of the 50+ years of drama that has occurred on the premises. The Rovers Return still stands despite changes in management and bar staff, one lorry crash, and not one, but two fires. Truly the most dangerous street in England. Difficult Men: behind the scenes of a creative revolution: from The Sopranos and The Wire to Mad Men and Breaking Bad by Brett Martin takes on the trend of entertainment that evolved in recent decades, perhaps beginning with Oz and The Sopranos, that saw shows that featured gritty story lines and characters who could be quite unlikeable. Such shows have given viewers a new emotional dilemma - becoming invested in a group of characters who are emotionally flawed and engage is some pretty bad behaviour - organized crime, adultery, bigamy, murder, vampirism ..... Martin explores the appeal of these difficult men in a way that analyzes our present culture and gives a historical context of television viewing. On a gentler note you can read about "stories of happiness, heartbreak, faith and friendship" in Heidi Thomas' The Life and Times of Call the Midwife: the official companion to seasons one and two. This immensely popular television series is based on a memoir by Jennifer Worth The Midwife: a memoir of birth, joy and hard times which relates Worth's experience as a midwife in poor communities in East London in the 1950s. This companion volume enriches the viewing experience by showing hour the fashions, homes and dining were re-creating to make this television series an authentic experience. In addition you will read character profiles that will help to feed your addiction to this series. Finally, let's take a look at Inside HBO's Game of Thrones by Bryan Cogman. Now, I have neither read nor watched Game of Thrones, but even I understand something nasty happened at the Red Wedding?!! In the preface George R.R. Martin writes about the challenges involved in making a filmed version of such a long epic tale. He writes that it is one thing for a writer to create a feast scene with one hundred hearths and one thousand costumed knights, but a totally different challenge for a producer with a budget. Inside this book you will find hundreds of photographs, storyboards, costume designs and interviews with producers, writers and crew about how this epic event came together.